762990003941 Features: -Technique: Tufted.-Material: Nylon.-Origin: United States.-Non-slip and bonded foam backing.-Bound on all four sides for natural border effect.-Ideal for wall or floor.-Care and Cleaning: Rugs should be cleaned with a mild detergent and water or cleaners developed for use on rugs and carpets.-Regular vacuuming helps rugs remain attractive and serviceable. Construction: -Construction: Machine made. Color/Finish: -Excellent detail with beautiful natural colors. 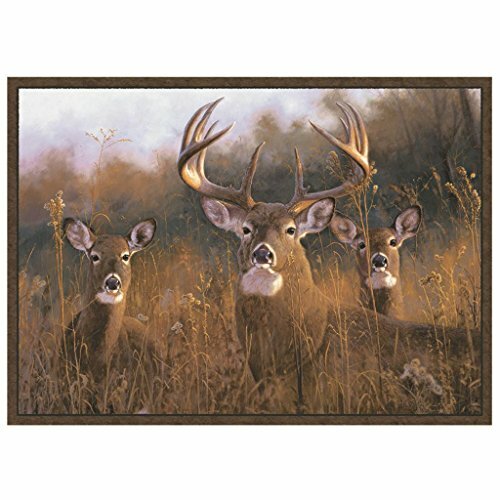 Dimensions: -Overall dimensions: 37'' H x 52'' W. Collection: -Collection: Wildlife. If you have any questions about this product by Custom Printed Rugs, contact us by completing and submitting the form below. If you are looking for a specif part number, please include it with your message.